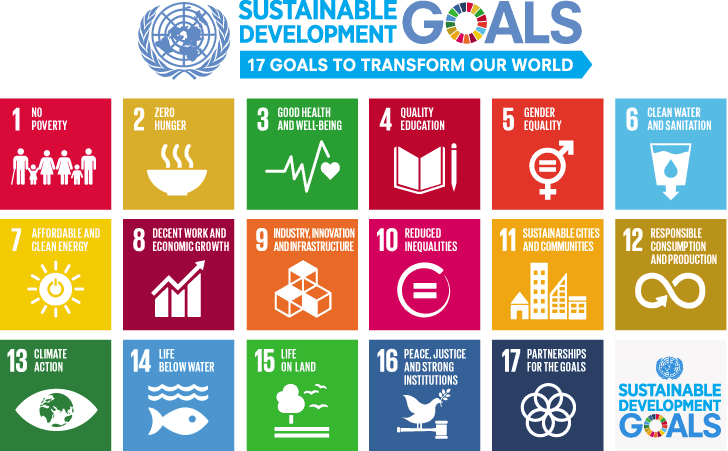 Sustainable Development Goals are the set of 17 Global goals, lead by United Nation through a deliberative process involving its 193 Member States. It is officially known as Transforming our world: the 2030 Agenda for Sustainable Development. The SDGs build on the Principles agreed upon under Resolution which is popularly known as The Future We Want. Here are the basic Goals we should focus for our better future. Remember the quoted assertion by Ban Ki-moon, the United Nations Secretary-General (2007 - 2016). "We don’t have plan B because there is no planet B". On 25 September 2015, the 194 countries of the UN General Assembly adopted the 2030 Development Agenda titled Transforming our world: the 2030 Agenda for Sustainable Development. The Official Agenda for Sustainable adopted on 25 September 2015 has 92 paragraphs. Paragraph 51 outlines the 17 Sustainable Development Goals and the associated 169 targets. Humankind faces many challenges, to ensure that all people have the same development and well-being opportunities. In the year 2000 the United Nations adopted eight objectives to meet the main needs of the poorest. 15 years later 193 countries adopted the 2030 agenda that sets out the sustainable development goals, a new horizon with the most pressing challenges for human beings, in the coming years. These are 17 ambitious goals that require the collaboration of civil society and the public and private sectors whose success means a more egalitarian and livable world. The eradication of poverty and hunger so as to ensure a healthy life. Achieve universal access to basic services such as water sanitation and sustainable energy. Support the generation of development opportunities through inclusive education and decent work. Foster innovation resilient infrastructures by creating communities and cities capable of producing and consuming in a sustainable way. Reduce inequalities in the world, especially gender inequalities. Caring for the environment by combating climate change and protecting oceans and terrestrial ecosystems. Promote collaboration between different social actors to create an environment of peace and sustainable development. If we achieve the sustainable development goals among people governments and companies we will make the world a more prosperous place for all. The 17 Global Goals are listed below, together with a key point. United Nation has listed all those lists and we the people should works on it to achieve all these goals. Here I will mention some of the steps to follow so that we could achieve all these goals. To achieve what we want we should invest our money and time in it. Invest you money and time in those projects or task or whatever that helps on achieving any one of these goals. If you are working in some projects make sure that it would try to solve any of these global goals. Invest your skill on making this world a better place. You can volunteer in social works, share the ideas and need of these global goals. Awareness program about environmental pollution, Global warming and the climate change. Everything in the world is interlinked. Any profession needs all other peoples form different skills to make get success oh his/her work. Make sure your upcoming project is to focus these global goal or try at least to solve a problem. What would be better, work done by a person or a work done by the group of person who believe in the same thing? Obviously collaborative works are the must successive works. Competition will give you the energy to win other team, which leads both the team to get success on. Collaborating in terms of moving forward towards the same goal. Competition among all to develop and implement the most effective and fastest way to reach there. Have no more than 2 children. Walk or Ride a bicycle or use a mass transit service when you can. Pay more for ethical / environment friendly clothes and products. Learn to wash clothes in cool settings. Support and contribute to animal conservation. Support other conservation and poverty alleviation efforts. Support innovation that helps us use less of everything. Informative one! Well done. Keep sharing such information brother. Thank you! We will try our best.